8 Winning Principles For Rebuke, Confrontation, And Discipline. The following 8 Principles and their related scriptures show the importance of this approach by the Apostle Paul in his own ministry. 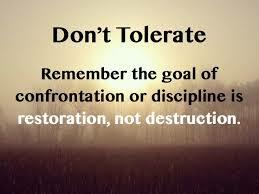 Sometimes rebuke, confrontation, and discipline is necessary, but use them with caution. As a Christian, your purpose for any rebuke, confrontation, or discipline should be to help the person(s), not hurt them! And, you may need to humble yourself and receive rebuke, confrontation, and discipline from your brothers and sisters in the Lord who may see shortcomings in your life that you don't clearly see. That we may all be refined and conformed to the image of God's Son, Jesus Christ and improve our relationships with fellow Christians and others we know.